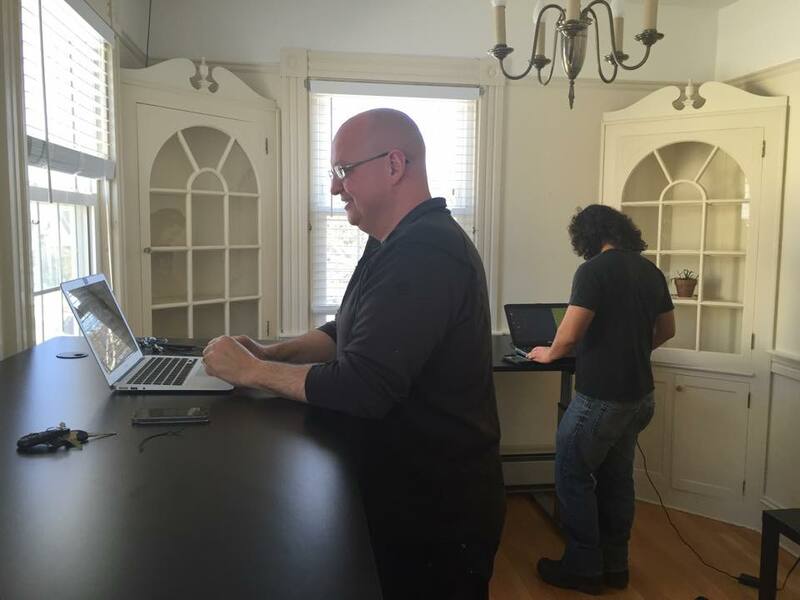 We get it; you don’t need workspace (and maybe you don’t even live in Bar Harbor or Ellsworth) but you want to be able to network with Anchorspace members; attend programs virtually; and promote your goods or services to an audience of local entrepreneurs. For $19/month, enjoy the perks of Anchorspace without paying for workspace you don’t need. 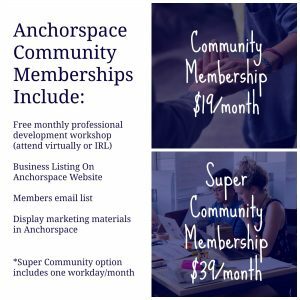 Being a Super Community member has all the same perks of Community Member (marketing opportunities, networking opportunities, professional development opportunities) but also one day a month you can use Anchorspace Bar Harbor. So save up all those videos you’ve been meaning to render or other tasks you’ve been putting off and get yourself in a place (and around the people) that can help you get it DONE. Want to host a webinar but need a corded internet connection in a private space? Are you a vendor who needs a showroom? 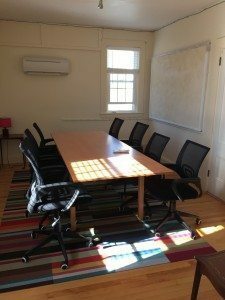 Need a private office while in the area? Our conference table seats 2-8 comfortably and has coffee/tea service, large screen TV (it’s on a cart) with all the computer hookups, and high speed corded and Wifi internet. It is also equipped with a marker board and several bulletin boards to create a lot of useable display space in the room. There is even a separate entrance so you can welcome your guests efficiently. Rates are $30/hour or $150/day. Working in Bar Harbor for a day? Get out of your car, coffee shop, or rental and come to a quiet place, set up a workstation for the day, and get what you need to get done, done. Rates are $20/day. With dedicated desks, high speed corded internet or WiFi available, and a full kitchen, we have what you need for the day. Reserve ahead and we can be open when you need us. A $10/hour fee beyond our regular business hours will be charged. For example if you book a day lasting from 12 pm to 6 pm, you’ll be charged $20 day rate plus $20 (for the 4-6 PM slot). This keeps us able to pay staff for overtime so thank you for understanding. Need to use Anchorspace a few days in a row? Our $50 weekly membership may be right for you! Come in during our regularly open hours (Monday through Friday, 8 AM to 4 PM) as much as you want during your designated week. A laptop user who comes and goes with your work $199/month means you can come and go as you please 24/7 and book the conference room for your occasional meeting. It’s kind of like a gym membership, but for your business/brain. Anchorspace’s affordable monthly rate ($399 includes everything) and month to month agreement means you can have an office longer term for as long as you need it and, along with the floating member benefits, your own dedicated desk. At all of our Anchorspace locations, we seek to offer flexible, affordable, and professional space for working, meetings, and events. Contact us with your questions and ideas.